Tropical Storm Irene roared into Vermont in the early morning hours of Sunday, Aug. 28, 2011 while many were still asleep. By morning, it was pouring up to 10 inches of rain onto the spine of the tiny state’s Green Mountains. 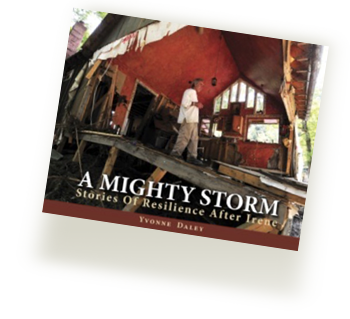 Twelve hours later Irene was gone, but in many towns the destruction was nearly total – and many small communities were completely cut off from the outside world. What happened next was not what you might think. Not only did the people in these tiny outposts and isolated communities work together to rescue the stranded and begin rebuilding roads, salvaging what they could from debris, but they rediscovered collective bonds of strength and resiliency that lie within all of us. From Wilmington to Waterbury, the Deerfield River to Lake Champlain, the storm transformed Vermont. And in the following months, Vermonters themselves. Yvonne Daley hit the ground running, returning to the Rutland Herald where she’d worked for nearly two decades to find her way into isolated towns throughout the state, trekking through wood’s trails, crossing streams, and riding four-wheelers to capture the rebuilding as it was happening. Adjectives like epic and historic seem hardly adequate to describe the worst weather event in 84 years that arrived at Vermont’s borders while most people were still asleep on August 28, 2011. There had been warnings of the storm’s power as it pummeled states to the south of Vermont. Residents had done as advised, filled the gas tank, loaded up on water and non-perishables, candles and batteries. But the average person associates gale-force winds with hurricanes. Irene had already been downgraded from hurricane to tropical storm status before it reached Vermont. Rain? Yes, there would be rain. Flooding was expected. Parts of the state had been through destructive floods twice already in 2011. Hopefully, Irene would be no worse. As it turned out, Vermont’s streams and rivers, even many of the state’s most placid brooks, could not hold the torrent of water, as much as eight inches in a few hours, that poured relentlessly onto already sodden ground. 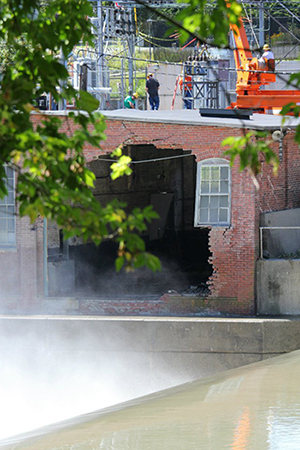 “I consider it a missile,” Randolph Fire Chief Ray Colette said of the gushing water that blasted through the Lincoln Bridge, leaving a 15-foot gap. Few Vermonters had experienced anything like it. Vermont had been primed for disaster. It had been an especially snowy winter, with up to 200 inches of snow recorded in some locations. Winter was followed by an exceptionally wet spring, generally three to five inches above the average monthly total, setting records in March, April and May. Those rains had brought severe flooding to Lake Champlain, which reached a record level of 103.20 feet on May 6, 2011, breaking the previous record set in 1869 and damaging 500 homes. The lake remained above flood stage for two months. And along the Winooski River, spring flooding had taken a heavy toll as swollen streams and rivers tore through central Vermont on May 26 and 27, swamping basements in Montpelier, flooding the newsroom and the press room for the Barre-Montpelier Times Argus, and pushing tons of silt into central Vermont homes and businesses. Indeed, as spring ended, Essex, Franklin, Grand Isle, Lamoille, Chittenden, Addison, Orleans and Washington counties were each so damaged from flooding that they qualified for federal disaster relief; many residents faced long months of rebuilding and refinancing. Vermont had a relatively dry summer but in mid-August, from the 15th to 16th, the state got drenched again. With precipitation totals of more than two inches in central and eastern Vermont and intermittent rain over the next two weeks, Vermont was essentially saturated. 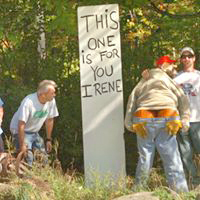 The name Irene comes from the Greek word meaning peace, but Tropical Storm Irene was far from peaceful. Every river town had a story to tell about its fury. Vermont’s topography and historic settlement patterns, in which towns grew up along streams and rivers, contributed to the problem. Even gentle brooks swelled in a remarkably short period of time due to the intensity of the rainfall, and with the swollen waters came unpredictable and often random damage to 82 towns and cities. For those following the storm, it was like watching a sweet friend turn relentless enemy as the rain arrived in Vermont’s southern extreme, where the pretty town of Wilmington was among the first to feel the brunt. 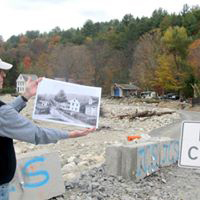 Quickly, the village of about 100 was cut off from the state highway system as a chest-high sluice of water and debris scoured 19th century-era structures in the town center. Buildings disappeared in the deluge; the concrete pad for a home on Route 9 remained while the house, or what was left of it, could be seen floating in nearby Lake Whitingham along with a dozen or so propane tanks. Town Clerk Susie Haughwout and a cadre of trusty friends spent hours using wheeled office chairs to move hundreds of pounds of town records, valuable maps and documents to the second floor while outside the Town Office windows a branch of the Deerfield River swelled and roiled. Haughwout finally left the town office as the river came rushing in, only to find her car inundated by floodwaters. The adjacent town police department had already been abandoned.